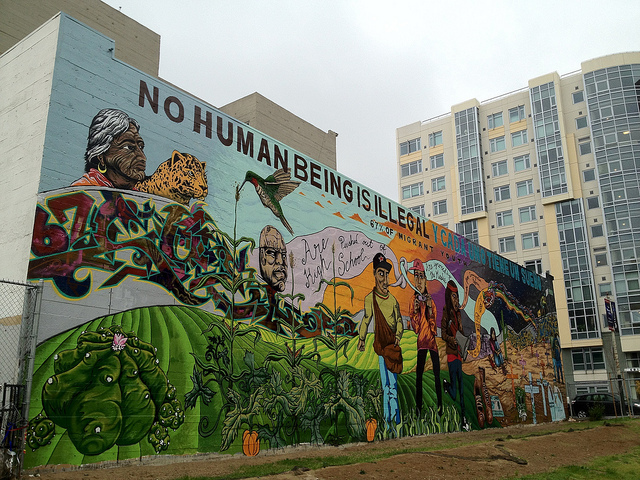 The struggle for immigrant justice is of course a political one. But it is also cultural. It is about changing the way we think about immigrants, and the stories we tell. Despite being a nation founded on immigration from Europe and the genocide of native peoples, the dominant narrative today is of dangerous, unlawful, and above all “illegal” immigrants coming to take what is rightfully “ours.” We have moved from talking about “illegal immigration” to talking about “illegal immigrants” — a small but important shift in subject. In the process, the word “illegal” has become more than a judicial term; it has become a racial epithet, and shorthand for this dominant — and false — story. 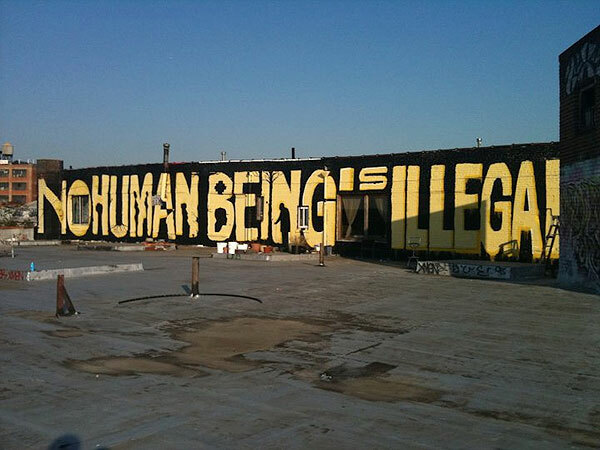 But a counter-story has emerged, finding its most condensed form in the powerful slogan “No Human Being Is Illegal.” While I’m not sure where the phrase originally emerged, it seems to have been popularized by a particular piece of art. 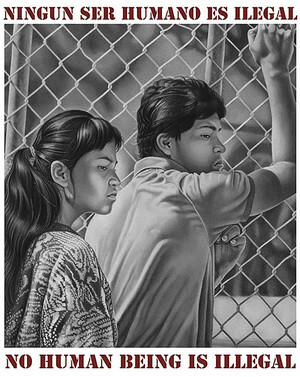 The poster, seen to the right, was used in 1988 as part of a campaign by the Central American Resource Center in LA, fighting for the rights of Central American war refugees. It features a stirring image by artist Mark Vallen. 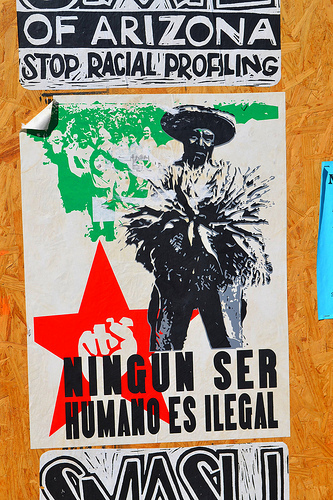 In 2010 the poster was republished, to support the current fight for immigrant rights. The phrase has spread like wildfire, serving as a call for humanization across the world. It has spawned murals, t-shirts, posters, graffitti, and more. Use of the i-word ignores the fact that our laws are unjustly applied. Immigrants without documents are regularly hired as cheap, exploited labor. No one else who benefits from the set up, including the employers who recruit and hire these migrants, is labeled this way. No one should ever be labeled this way. 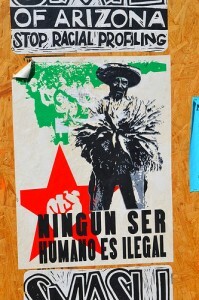 No human being is illegal. So in honor of May Day, or just because it is a Thursday and it feels right, pledge to drop the i-word. 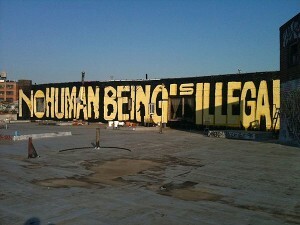 Absolutely no human being is illegal. 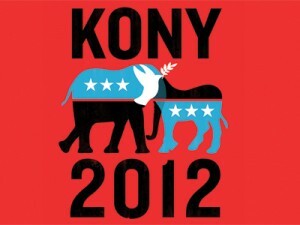 Tonight the Kony 2012 campaign kicks into high gear with “Paint the Night.” This can serve as a moment to reflect on the power of narrative in social change, and the danger of the simplified story. A big focus of this blog is on the stories that we tell about ourselves — the stories that trap, the stories that marginalize, and the stories that liberate. Cultural organizing, in many ways, can be seen as a centering of the narrative of social change. We can offer new narratives, show the flaws in mainstream narratives, and uncover narratives that are kept out of the conversation. New media has become a major way such narratives are constructed and negotiated, and powerful strategies have been developed to center narrative in organizing efforts by groups like SmartMeme. Once upon a time there was a very evil man, who forced children to do horrible things in war. He needs to be (individually) brought to justice, and you can be one of the heroes of this grassroots movement to save Ugandan children. First of all, it is oversimplified, with a good-guy/bad-guy binary that leaves out some of the most important actors — particularly other Ugandans. All narratives need to be simplified to have meaning, but you can go too far. Second, It is totally devoid of context or systems, and thus doesn’t get to the root of the problem. Child soldiers have been used in 80 percent of civil wars in the last few decades, and the phenomenon results from a number of important factors such as type of government and amount of GDP invested in the military — not merely one psychopath. Third, It mimics too neatly the long-running colonial narrative of the western savior in Africa, which has certainly done more harm than good over the centuries. Meanwhile, the actual role that countries like the US have played in creating and perpetuating issues in Africa is silenced. Does this narrative explain the real core problem being addressed? Does the solution it offers address that core problem? Does it include the most important actors? Are those most directly affected by the issue presented as active agents rather than just victims? Does it feel authentic to those experiencing the situation first hand? Does it draw on other, problematic or oppressive narratives in our culture? 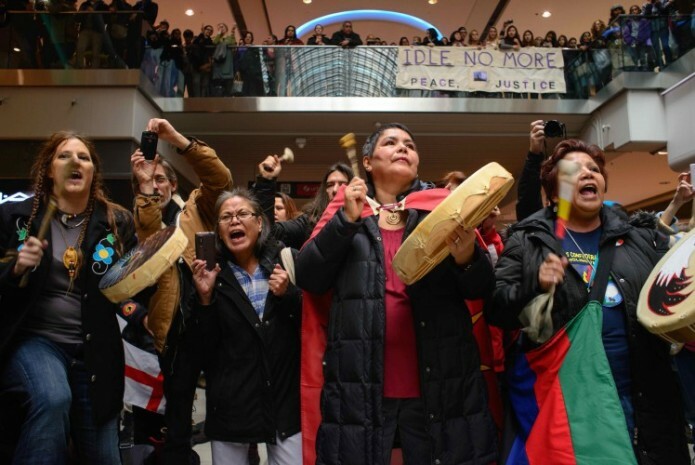 There is power in the well-told, media-savvy narrative of social change, but without deep reflection, there are plenty of pitfalls along the way.